It wasn’t that long ago that talking to computers was the preserve of movies and science fiction. Slowly, voice recognition improved, and these days it’s getting to be pretty usable. The technology has moved beyond basic keywords, and can now parse sentences in natural language. [Liz Meyers] has been working with the technology, creating WhatIsThat – an AI that can tell you what it’s looking at. Adding a camera to Google’s AIY Voice Kit makes for a versatile object identification system. The device is built around Google’s AIY Voice Kit, which consists of a Raspberry Pi with some additional hardware and software to enable it to process voice queries. [Liz] combined this with a Raspberry Pi camera and the Google Cloud Vision API. This allows WhatIsThat to respond to users asking questions by taking a photo, and then identifying what it sees in the frame. It may seem like a frivolous project to those with working vision, but there is serious potential for this technology in the accessibility space. The device can not only describe things like animals or other objects, it can also read text aloud and even identify logos. The ability of the software to go beyond is impressive – a video demonstration shows the AI correctly identifying a Boston Terrier, and attributing a quote to Albert Einstein. Artificial intelligence has made a huge difference to the viability of voice recognition – because it’s one thing to understand the words, and another to understand what they mean when strung together. Video after the break. It’s entertaining to watch [Wassim] issue commands and have the desk slowly rise in response. Of course, there are other approaches, like this sneaky use of PVC to hack the office furniture. But if you’re too sick to grill up your own and don’t have anyone to do it for you, this grilled cheese sandwich-making robot might be the perfect kitchen accessory. Dubbed “The Cheeseborg” and built as a semester project by [Taylor Tabb], [Mitchell Riek], and [Evan Hill] at Carnegie-Mellon University, the bot takes a few shortcuts that might rankle the grilled cheese purist. Chief among these is the use of a sandwich press rather than a plain griddle. We understand that this greatly simplifies the flipping problem, but to us the flipping, especially the final high arcing double backflip onto the sandwich plate, is all part of the experience. Yes, a fair number of sandwiches end up going to the dog that way, but that’s beside the point. As realized, Cheeseborg feeds bread and cheese from stacks using a vacuum arm, sprays the grill with butter, and uses a motorized arm to push the uncooked sandwich into the press. At the peak of grilled perfection, the press opens and ejects the sandwich to a waiting plate. As an added bonus, the whole thing is Google Assistant enabled so you can beseech Cheeseborg to fix you a sandwich from your sick bed. See it in action below. This is far from the first culinary robot to grace our pages. There was the recent CNC sausage bot, we’ve seen plenty of pancake bots, and even [Ben Krasnow] once automated cookie making. In the near future of the Smart Home, you will be able to control anything with your voice. Assuming that everything supports the Smart Home standard you chose, that is. If you have a device that supports one of the other standards, you’ll end up uselessly yelling at it. Unless you use gBridge. As the name suggests, gBridge is a bridge between Google Assistant devices and the rest of the smart home universe. It’s an open source project that is available as a Docker image can be run on a low power device in the home, or on a hosted service. Fundamentally, gBridge is a Google Assistant to MQTT translator. Message Queuing Telemetry Transport (MQTT) is the messaging protocol that many smart home devices use, as it runs over TCP and doesn’t take much power to implement. We’ve covered how to bash around in MQTT and do much of this yourself here, but gBridge looks to be somewhat easier to use. It’s just come out of beta test, and it looks like it might be a good way to get into Smart Home hacking. There are, of course, plenty of other ways of doing this, such as IFFFT, but [Peter Kappelt], the brains behind gBridge, claims that it is more flexible, as it offers support for the whole Google Assistant vocabulary, so you can do things like put devices into groups or do more conditional control (such as if the light level in the hallway rises above a certain amount, start recording with a camera) with non-Google devices. [Peter] is also looking to run gBridge as a hosted service, where he does the behind the scenes stuff to update servers, etc, in return for a small fee. [William] got the idea for this project after first playing with the Internet Radio Linking Project, a system which uses VoIP technologies to link radio networks over the internet. Already having an IRLP node, it seemed only natural to make it into a gateway to the wider internet through integration with Google Assistant. Early work involved activating the assistant via DTMF tones, but [William] didn’t stop there – through the use of Picovoice, it became possible to use the system with the custom wakeword “Bumblebee”. [William]’s project could prove particularly useful for when he’s out of cell coverage, but needs a little information like a weather report or a piece of trivia to settle an argument round the campfire. Additionally, it’s even possible to control the IRLP node through voice commands, too. If you’re just getting started with ham radio, check out this build to get you started for under $100. Video after the break. [igorfonseca83] writes in to share with us his modular tank platform that uses the ESP8266 and a handful of software hacks to allow for voice control from the user’s mobile device. 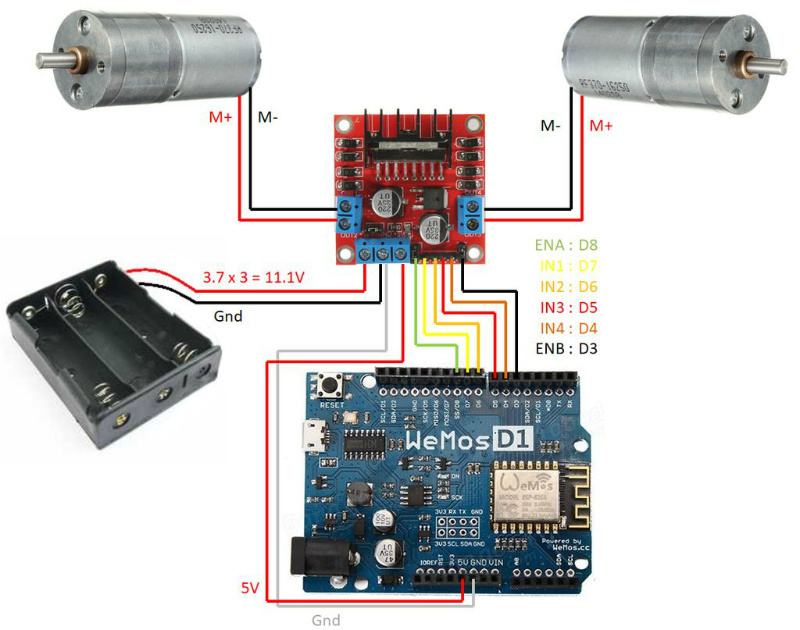 Presented as a step-by-step guide on Hackaday.io, this project is perfect for getting started in Internet-controlled robotics. Whether you just want to experiment with Google Assistant integration or use this as a blank slate to bootstrap a remotely controlled rover, this project has a lot to offer. The chassis itself is a commercially available kit, and [igorfonseca83] uses a L298N dual channel H-bridge module to control its two geared motors. A Wemos D1 serves as the brains of the operation, and three 18650 3.7V batteries provide the juice to keep everything running. There’s plenty of expansion capability to add sensors and other gear, but for this project getting it rolling was the only concern. Software wise, there are a number of pieces that work together to provide the Google Assistant control demonstrated in the video after the break. It starts by interfacing the ESP8266 board Adafruit.IO, which connects to IFTTT, and then finally Google Assistant. By setting up a few two variable phrases in IFTTT that get triggered by voice commands in Google Assistant, you can push commands back down to the ESP8266 through Adafruit.IO. It’s a somewhat convoluted setup, admittedly, but the fact that involves very little programming makes it an interesting solution for anyone who doesn’t want to get bogged down with all the minutiae of developing your own Internet control stack. [igorfonseca83] is no stranger to building remotely controlled rovers. Last year we covered another of his creations which was commanded through a web browser and carried an Android phone to stream video of its adventures.